The purpose of this investigation was four-fold: firstly, to study the solubility profile of 10-hydroxy-Camptothecin (10HC) in neutral and alkaline pH, secondly to study the solubility and stability of 10HC in aqueous solutions containing co-solvents and surfactants, thirdly, to provide a mechanistic explanation for its improved solubility and stability in the presence of micelles and lastly, to establish universal thermodynamic parameters for the objective evaluation of micelle performance. Contrary to expectations, saturated solutions of 10HC at basic pH contained both the lactone and carboxylate forms. This phenomenon was attributed to pseudo-equilibrium between the solid and aqueous anionic lactone and carboxylate forms of the drug. The combination 2 % w/v SDS with 60 % v/v PEG400 provided maximum solubilization capacity due to a higher binding affinity of 10HC-lactone toward SDS-PEG400 micelles. Quantitative evaluation of the standard enthalpies of association and hydrolysis indicated that the drug is fully protected from hydrolysis inside the SDS micelles. 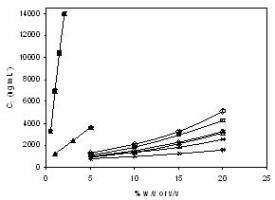 Lastly, the thermodynamic stability of 10HC-loaded micelle formulations was evaluated under isothermal conditions at various constant volume dilutions. This novel approach provided concentration-independent evaluation of micelle stability and can further be used as a guide for carrier selection for optimum delivery of sparingly soluble drugs.